Oil on paper mounted on panel, 11 x 17 in. America’s highest ranking artist of the late 1850s and 1860s, Frederic Edwin Church painted landscapes that reflected his penchant for heroic subjects, as well as his love of the natural world. His awe-inspiring portrayals of wilderness sites in North and South America earned him a reputation as an “artist of scientific eloquence” whose work captivated throngs of art aficionados on both sides of the Atlantic. Born into a prosperous Calvinist family in Hartford, Connecticut, Church’s artistic aspirations were encouraged by his neighbor, Daniel Wadsworth, an amateur artist and architect. In 1844, after periods of study with Benjamin H. Coe and Alexander H. Emmons (both local painters), Church moved to Catskill, New York, where, through his connection with Wadsworth, he became Cole’s pupil. The founder of the Hudson River School, Cole played a key role in Church’s aesthetic evolution, introducing him to his romantic realist style and impressing upon him the importance of sketching directly from nature. Upon completing his training under Cole in 1846, Church moved to New York and established his studio in the Art-Union Building. In the ensuing years, he made summer sketching trips to locales in New York, New England, Virginia, and the Canadian Maritimes, going on to create finished landscapes that he sold to the American Art-Union. Recognized for his superb draftsmanship and his skills as a colorist, he also exhibited regularly at the National Academy of Design, where he was elected an Associate member in 1848 and an Academician in 1849, the youngest artist accorded such an honor. During this period, as Church familiarized himself with the “truth to nature” philosophy espoused by the English painter and theoretician, John Ruskin, he abandoned Cole’s painterly approach in favor of a more meticulous style. He also came into contact with the writings of Baron Alexander von Humboldt (1769–1859), a renowned Prussian naturalist and explorer who traveled throughout South America between 1799 and 1804 and was captivated by the scenic beauty he encountered there. 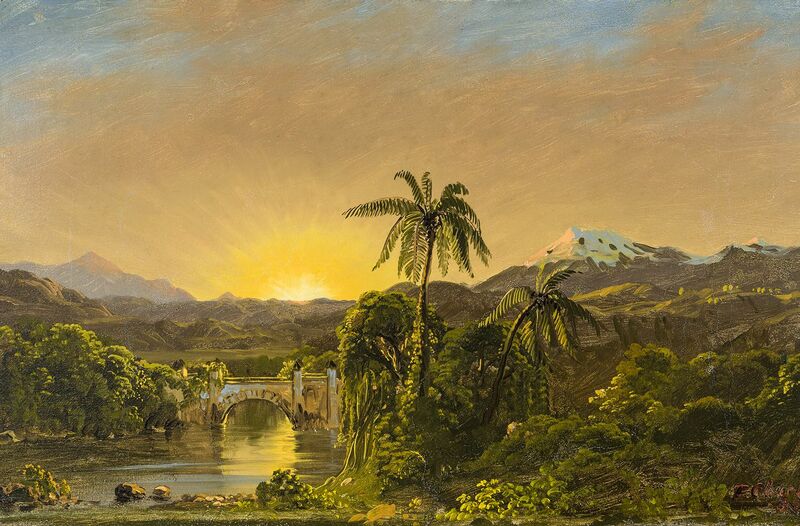 In his book, Cosmos, von Humboldt advocated that artists seek out the “humid mountain valleys of the tropical world to seize . . . on the true image of the varied forms of nature,” and Church, who owned a copy, took this advice to heart. Indeed, while his contemporaries set their sights on Europe, the twenty-seven-year-old Church took a different tact: in April of 1853 he left New York, spending the next five months traveling throughout Columbia and Ecuador, accompanied by his friend, the businessman and telegraph entrepreneur Cyrus W. Field. During his trip, Church documented his wanderings by making drawings and studies that, along with his visual memory, served as reference sources for the large-scale paintings he would produce back in his New York studio. In 1855, Church exhibited four of his tropical subjects at the annual exhibition of the National Academy. His venture into this hitherto unexplored theme caught the attention of a number of critics, who, accustomed to his views of New England, took great delight in his South American pictures. Encouraged by this recognition and the financial rewards that went with it, Church decided to enhance his familiarity with the Edenic scenery of South America by making a second expedition to South America in the spring of 1857.